If you saw the news last week, you saw that Fermilab announced a new precision measurement of the W boson. While this particle is a key building block for the structure of our world, it doesn’t even get a mention in American high school text books. Because of that, the value of such results can be easily lost on the public. Yet the step-by-step, layered approach to science means that it requires many potentially unheralded result to pave the path to discovery. With that in mind, I hope to explain here why you should take notice of the W boson mass measurement. 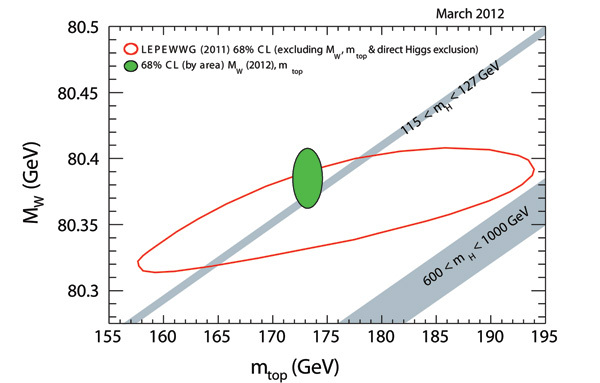 The new CDF and Dzero combined result for the W boson mass (vertical section of green oval), combined with the world's best value for the top quark mass (horizontal section of green oval), restricts the Higgs mass requiring it to be less than 152 GeV/c2 with 95 percent probability. 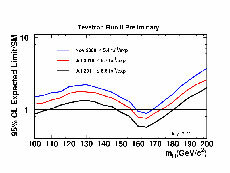 Direct searches have narrowed the allowed Higgs mass range to 115-127 GeV/c2. The grey bar shows the remaining area the Higgs could reside in. If you’re seeking clues to the hiding place of the theorized Higgs boson and whether scientists understand how the basic building blocks of matter come together to create our world, you need to measure the mass of the W boson particle. This building block of nature gave rise to the Higgs theory and has the power to prove if the Standard Model is correct, or if physics textbooks need a rewrite. The Standard Model serves as the blueprint for our world, detailing the properties of the building blocks of matter and how they interact. 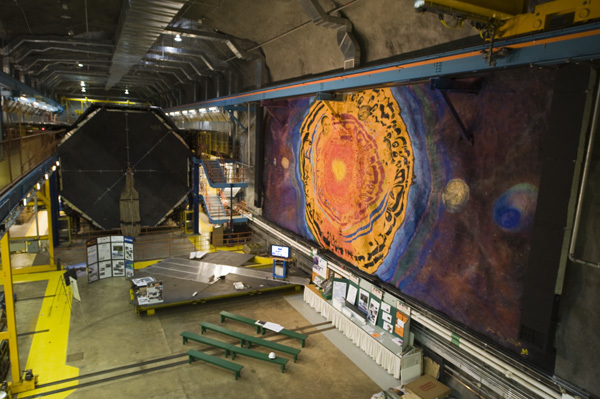 Last week the world’s most precise measurement of the W boson mass was unveiled by scientists at the CDF and DZero collaborations using data gathered with the Tevatron accelerator at the U. S. Department of Energy’s Fermi National Accelerator Laboratory. The precision of this joint measurement surpasses all previous measurements combined. 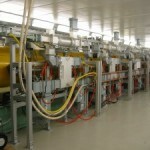 This measurement comes at a pivotal time, just before physicists from experiments at the Tevatron and the Large Hadron Collider at CERN will present their new results this week in the hunt for the Higgs at the annual conference on Electroweak Interactions and Unified Theories known as Rencontres de Moriond in Italy. 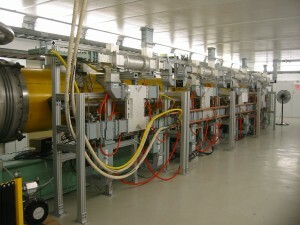 The Tevatron experiments found the mass for the W boson to be exactly as predicted. 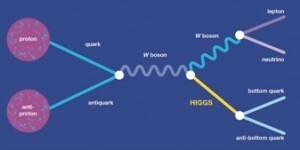 This indicates that if a Higgs boson exists in the Standard Model framework, it should be right where the Tevatron and LHC experiments and are looking. The Higgs boson is the last undiscovered component of the Standard Model and theorized to give fundamental particles mass. Without mass, atoms would not exist. Just as firemen sweep building floors to rule out the existence of trapped homeowners, physicists have used direct and indirect observations from experiments to rule out the existence of the Higgs boson in most mass ranges where the Standard Model predicts it could reside. This new W mass measurement, combined with the lower limit established at the LEP experiment at CERN many years ago and the latest measurement of the mass of the top quark, determines that a Standard Model Higgs boson can not have a mass larger than 145 GeV, or giga-electronvolt. This is consistent with recent direct searches at the LHC that constrain the possible home of the Higgs to below 130 GeV. This measurement illustrates the power of the Tevatron and how its expertise in precision physics can point the way to discoveries and cross-check any future discoveries made at the LHC. 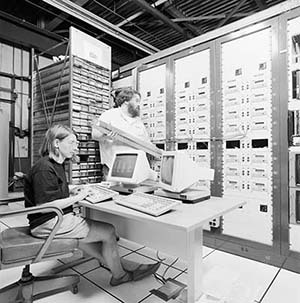 The CDF collaboration measured the W boson mass to be 80387 +/- 19 MeV/c2. 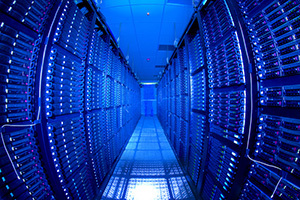 The DZero collaboration measured the particle’s mass to be 80375 +-23 MeV/c2. 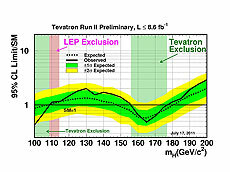 The two measurements combined along with the addition of previous data from the earliest operation of the Tevatron produces a measurement of 80387 +- 17 MeV/c2, which has a precision of 0.02 percent. These ultra-precise, rigorous measurements took up to five years for the collaborations to complete independently. The collaborations measured the particle’s mass in six different ways, which all match and combine for a result that is twice as precise as the previous measurement. The new W mass measurement and the latest precision determination of the mass of the top quark from Fermilab triangulate the location of the Higgs particle and restrict its mass to less than 152 GeV/c2 . This is in agreement with the latest direct searches at the LHC, which constrain the Higgs mass to less than 127 GeV/c2, and direct-search limits from the Tevatron, which point to a Higgs mass of less than 156 GeV/c2, before the update of their results expected this week. 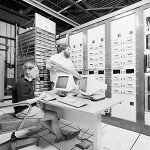 Measurements of the W boson mass provide critical stress tests of the accuracy of the Standard Model. If the mass were not as predicted, that would suggest that physicists’ understanding of nature as explained by the Standard Model is wrong, and imply the existence of undiscovered particles or forces. In principal, the W mass might shine a light on all sorts of new physics models. Physicists attach such importance to the mass of the W boson because the existence of the world we live in depends on it living up to predictions. 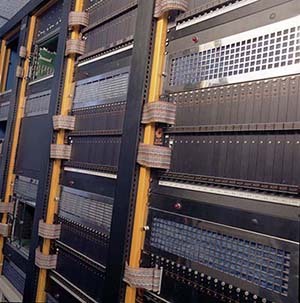 The W boson is a carrier of the electroweak nuclear force, which binds objects together across far distances. Making it massless would eliminate this force leaving in the world only the strong force, which binds things at the atomic level. The world would be so widely different form what we know if the W boson had no mass. Ordinary atoms and matter as we know it could not exist, and we certainly wouldn’t exist. 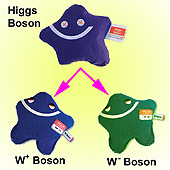 A need to explain why the mass of the W boson is 85 times the mass of the proton gave rise to Higgs theory. This explained the “extra” mass acquired when the W boson passes through a molasses-like Higgs energy field. As if the molasses is sticking to it, the particle slows down and in accordance with Einstein’s Theory of Special Relativity gets more massive. On Tuesday, Aug. 23, the Tevatron accelerator knew something none of the people operating it knew. 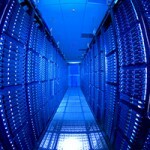 It felt what employees didn’t, and it reported the news faster than the media could upload it to the Internet. A 5.9-magnitude earthquake had struck the East Coast, and the super-sensitive Tevatron felt it as it happened about 600 miles away. It had also registered a similar quake in Colorado the night before. 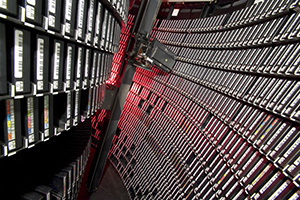 The quakes were recorded by sensors on large underground focusing magnets that compress particle beams from the four-mile Tevatron ring into precision collisions at the CDF and DZero detectors. 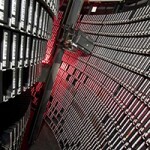 The sensors keep these areas most sensitive to misalignment under constant surveillance. 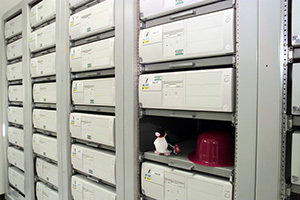 Quakes can jiggle small numbers of particles – less than one percent of the beam – out of alignment and force the shutdown of parts of the three-story detectors to avoid damage. Tevatron operators compare the sensor recordings with updates from the U.S. Geological Survey to rule out natural causes before having to spend time diagnosing machine trouble that caused beam movement. Typically, two quakes occurring in this short a timeframe would cause headaches for those who run the Tevatron, but fortunately the machine didn’t have beam in the tunnels at the time. 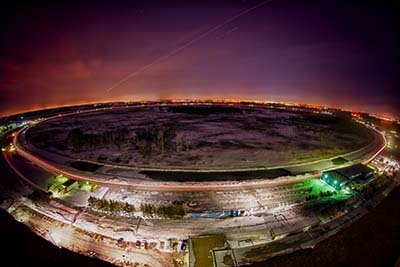 The Tevatron has recorded more than 20 earthquakes from all over the globe, as well as the deadly tsunamis in Sumatra in 2005 and in Japan in March.